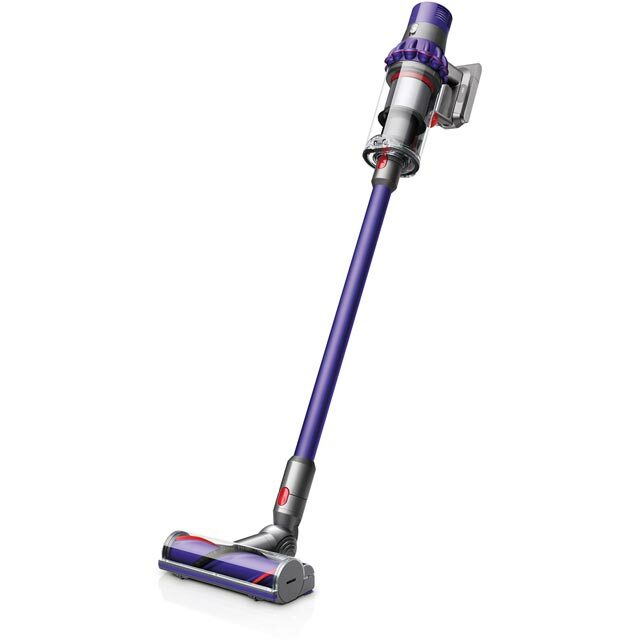 With a 40 minute run time from a single charge, this cordless vacuum cleaner from Dyson is perfect for giving your whole home a thorough clean. It uses 2 Tier Radial™ cyclone technology to improve airflow by separating air and dust - for powerful suction. The Direct Drive cleaner head is powered by the motor, making it really effective at removing ground-in dirt. It comes with a Mini Motorised tool as well, which uses stiff bristles to work deep into carpet fibres. This model also has a useful docking station which not only stores your vacuum, but charges it as well. Thanks to its brilliant run time, this vacuum cleaner lets you enjoy fantastic performance for longer. When it’s fully charged, it will provide powerful suction for up to 40 minutes without weakening. This means you’ll have plenty of time to give each room a really thorough clean, so you can effortlessly leave your whole home spotless. Thanks to the dust bin’s clever no-touch design, you’ll never have to get your hands dirty. When you get to the bin, simply pull the lever to get rid of all the dirt and debris. Not only does this mean it’s really quick and simple to empty, but it’s hygienic and mess-free too, making the vacuuming even easier. 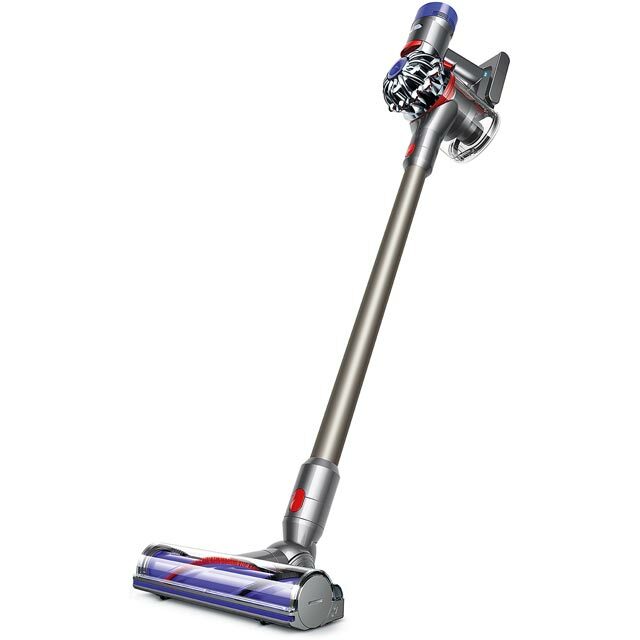 You’ll never miss a speck of dust or debris again with this vacuum cleaner’s motorised brush bar. When you attach this tool, the powerful motor drives the bristles so that they dislodge hair and dirt from deep in the carpet fibres. So, whether you’re cleaning up pet fur or ground-in mud, you know it’ll give incredible results. Thanks to the advanced filtration system, you can enjoy beautifully clean air as well as spotless carpets. With a pressurised rubber seal around the filter, dust and allergens can’t escape back into your home, so the air that’s released is cleaner than the air in the room. This helps you breathe easier while leaving your carpets perfectly clear. I cannot recommend this Dyson enough. Its a breeze to set up and so easy to use! With having two small children and working long hours, this is the best buy of the year so far! My other half and I now fight over who gets to hoover because we enjoy doing it so much! After visiting a friend, who had one, we were so impressed that we wanted to replace our old upright hoover with this cordless Dyson. It is so light and easy to manoeuvre. Hoovering the stairs used to be a chore but it’s easy now. Even though I always use it on max suction (resulting in fewer minutes between charges) this doesn’t bother me at all. I do a burst of hoovering in the morning, charge it during the day, then do a burst in the evening. It is wonderful and I completely recommend! Really wasn’t expecting much from a cordless vacuum as I’ve had them before and never met my corded vacuum standards. This vacuum however is fantastic! Battery is fab, it picks up the dirt and it’s light! What more could you want? Fantastic product! Best suction ever and I’ve tried a lot of hoovers! Brilliant on hard floors and makes the stairs a breeze! Comes with lots of attachments too! Very happy with this product! A good product that does what we need - lightweight, easy to use. Empties easily and picks up well especially on “max power”. Battery life ok but max power only last 5-10 minutes or so. Normal power ok for most tasks.